My friend C is a big paper fan, and so we had a blast at The National Stationery Show walking every aisle and checking out the cards, paper, pencils, and accessories, all the while comparing notes on our favorites. She was scouting things for her mom's small business while I was scouting things for my small blog, so our agendas overlapped. One early stop was the O'BON booth, whose products I remembered mostly from OfficeSupplyGeek's reviews. 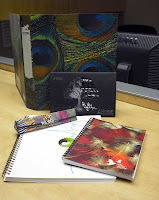 But C hadn't heard of them, and was amazed at the quality and silky feel of the sugar cane paper. She's used bagasse paper before and hadn't been impressed, so this was a new experience for her. When O'BON generously offered to send me samples of their products to review I knew that C had to have one of their sugar cane notebooks to test; she got the (very pretty, I might add) Sugarcane A4 White Journal with blue writing on it, a nice addition to her own notebook collection. It's a handsome-looking notebook, with a bright white card stock cover that feels like it can hold up to the wear and tear of going 90 days in a backpack or messenger bag without looking like the dog sat on it. What really surprised C, besides the smooth paper surface that was very easy to write on, was the superior quality of the bagasse itself. 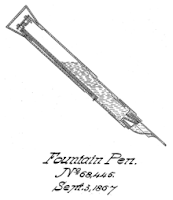 It handled the rollerball, pencil, ballpoint, and fountain pen with ease, no blotches, feathering, or skipped letters. Most importantly with the rollerball and fountain pen, there was no bleed through. 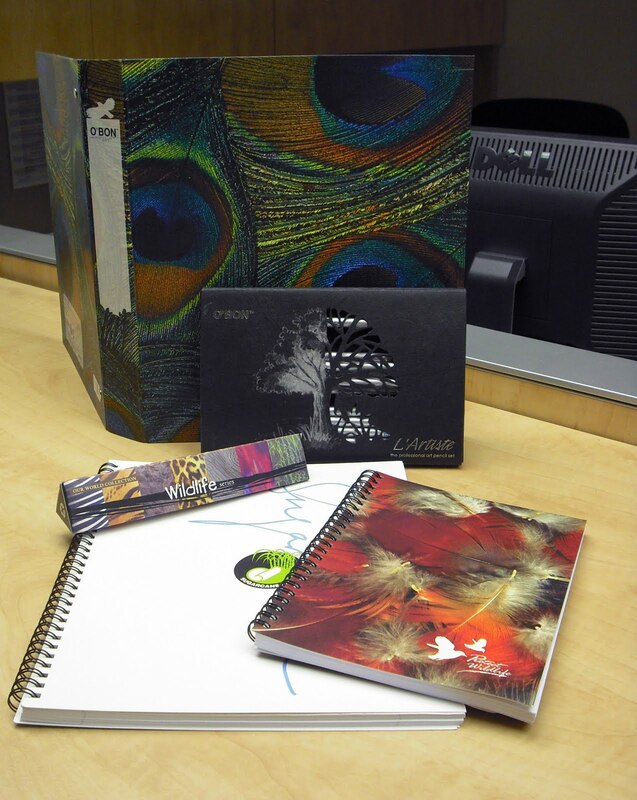 If you're into bagasse paper, green goods, or just like quality notebooks then you definitely want to check out the O'BON notebook line. I realize that this isn't an economically great time for most people, so a $6 notebook is a luxury. But if you've got a few extra dollars, then I'd say it's quite worth the cost. Check out their website, as there are some other great notebooks they offer such as the delicious-looking O'BONanaza lineup. Can anyone identify the two objects to the left of the small book? One seems to have an extension on it, as though it was meant to be grasped as a handle. 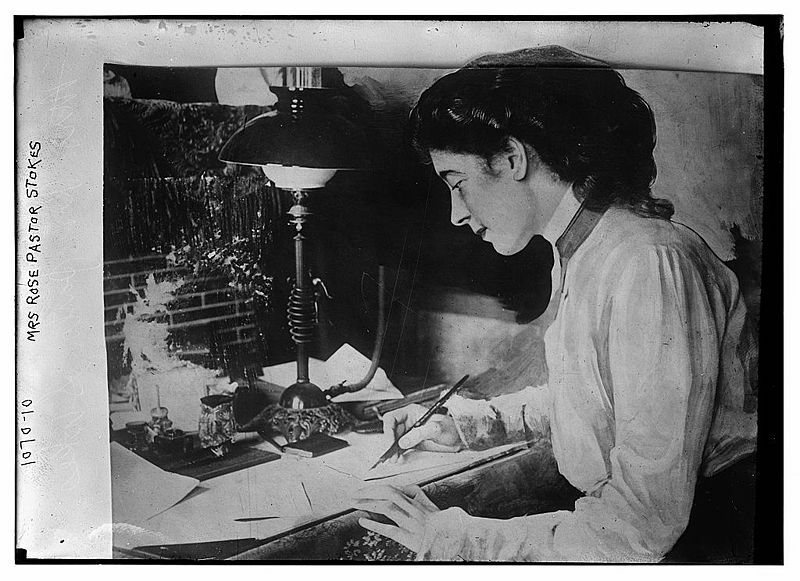 What is that dip pen she's using, or maybe an early eyedropper meant to resemble a dip pen? 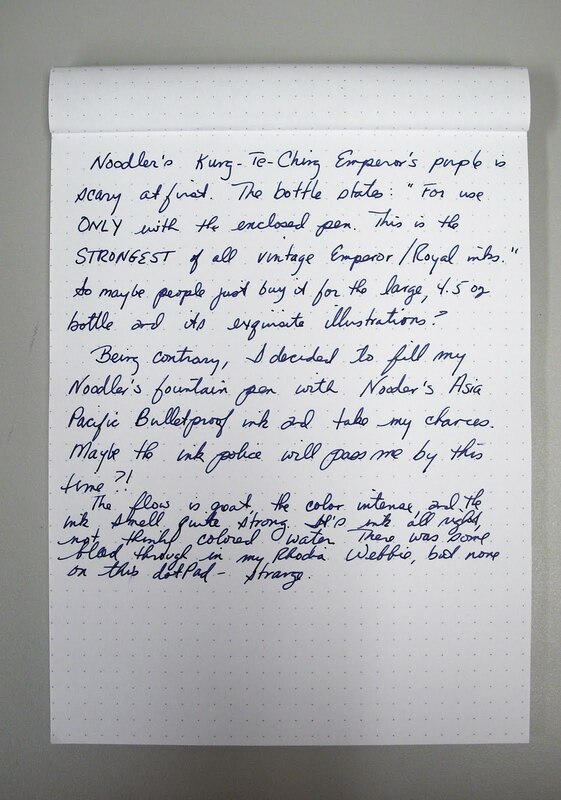 Another ink I received to review from Lily Kim of JetPens was a bottle of Noodler's Kung Te-cheng Emperor's Purple ink, one of Noodler's specialty inks from the Asia Pacific Bulletproof series. The 4.5 oz bottle is one of the most detailed I've ever seen, showing stylized drawings of Confucius and his 77th lineal descendent, Kung Te-cheng. It was Confucius who noted that the weakest ink is better than the strongest memory, an exhortation to keeping a journal if there ever was one. The ink's color is an imperial purple, deep blue-purple that comes as close to the original as Noodler's could get given the very limited samples available to them. As noted on the bottle, this ink is the strongest one made by Noodler's and so should be used in eye dropper fountain pens only. For that reason an empty Platinum Preppy fountain pen and highlighter are included with the set, to make your own Emperor's Purple pens. Being contrary I decided to give the ink a try in my Noodler's fountain pen (a review to follow, but TAO at Bleubug has a very thorough review of these pens). The first thing you notice is how strong the ink smells, a commingling of astringent chemicals laced with a hint of sweet crude oil. (One word of advice: vanillin, try it.) The next thing you see is the eye dropper cap, which is interesting if you decide not to follow instructions. Inking up wasn't difficult even with the aerometric filler on the Noodler's fountain pen (that's why coffee stirrers were invented), and the ink was taken out for a test drive. As with all the Noodler's inks I've used, it makes the pen a wet writer and there's a lot of nib creep. First go in a Rhodia Webbie produced definite bleed through on the paper; second time with a Rhodia dotPad notepad was fine, heavy shadowing but no ink on the opposite side. But let's get to the best part of this ink, the color. It is a definite deep blue-purple, so thoroughly mixed that you can't tell which color dominates. It's not blue with a hint of purple, or purple with a hint of blue, but the two together making something totally different. I've enjoyed writing with this ink in my Noodler's pen, just letting the rich color flow over me. If you're not intimidated by the warning on the bottle, or you don't want to use any of your regular fountain pens with this ink, definitely try out the Kung Te-cheng. I'd been looking at it for some time at JetPens, and was thrilled when I saw it was one of the inks in my goody bag from Lily Kim. 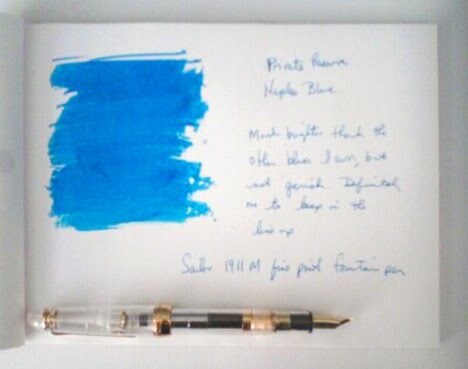 It is a great ink color and you should have one like it in your collection. Private Reserve ink is one of the workhorses of the ink work, with 45 colors available in bottles or cartridges at a very reasonable price. 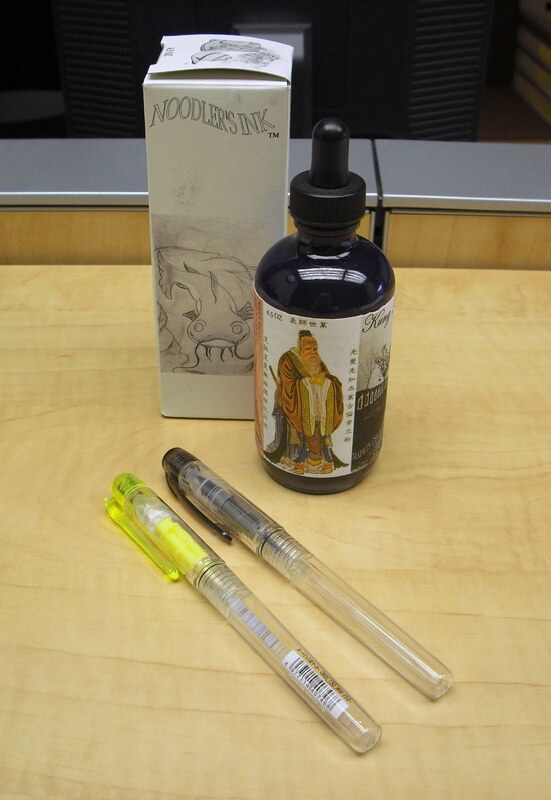 The wide mouth bottle makes inking a fountain pen very easy, while the relatively low height helps you get every last drop into that converter. The selection of colors is amazing, available in 50 ml bottles, and if what you see doesn't strike your fancy you can buy Private Reserve's ink mixing kit and make your own special color. So I was very excited when Lily Kim of JetPens very generously sent me some inks to play with and included this Private Reserve Naples Blue. I would never have bought it on my own as the color in the sample chart looks too pale for my taste; I'd rather go with Tanzanite or Sonic Blue, which are similar to colors I already own and therefore I know I'll like. Surprise, Naples Blue isn't as electric neon as I thought, and I like the color that comes out on the crisp white paper. The ink oxidizes slightly so that the blue gets a touch darker after a few moments, toning down the color and bringing out the beauty of this shade. Writing was fluid and the ink dried quickly, making it a joy to use in my Sailor 1911M fine nib fountain pen on a Rhodia 80gsm notepad. If you're looking for a different blue to try, definitely put this on your list to consider. 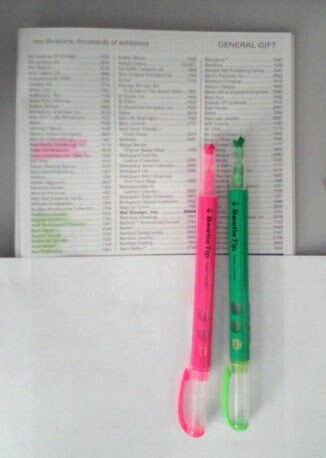 While I'm not much on highlighting anymore having overdone it in college (my text books look like they're printed on yellow paper), every once in awhile I do need to note something and reach for one of the freebie highlighter pens picked up at a vendor show. But a few weeks ago I found the Kokuyo Beetle Tip highlighters at a bookstore in mid-town and picked up the pink and green ones. The Beetle Tip highlighter was one of three winners of the 2007 Kokuyo Design Award, and was designed by Park Misaki. The pen went into production in 2008, and seems to be a big hit; you can purchase them at JetPens, and they are a great way to round out an order for free shipping. The power of suggestion being what it is, the tip does seem to represent a beetle's mandible, or something insectoid. This is one of the most interesting pens, highlighter or regular, that I've ever used. 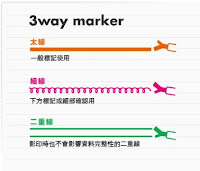 The tip is meant to be used in three ways: for highlighting as a double line, for giving a bold broad stroke across the page, and as a sharp accent line. I tend to just need a broad stroke, but I'm thinking of playing with that double line. The color isn't as bright as some highlighters, which is actually a plus in my book as I don't want the neon screaming all over the page. Just point out to me what I thought was so important when I first read the material, thank you. And the Beetle Tip does just that. My little girl Seranne, who was about 1 year old in this pic (she's now 2 1/2). 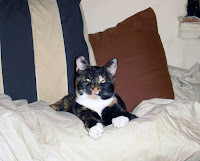 She's a stray, found walking down a street in Brooklyn and taken to a shelter where she was picked up by a cat rescue group. They estimated she was about 3 months old, and in amazingly good condition so she was probably someone's little girl. About 10 days after they found her, I adopted her. High maintenance, and visually impaired although you wouldn't know it from all the zooming around she does in the apartment. She can also find my toes and fingers in pitch dark. But every once in awhile she'll miss her jump or crash into the wall rather than run through the door. She has heavy scar tissue on her eyes, due they thought to her having a cold that migrated to her eyes. I remember seeing her in the adoption van and thinking "that is the ugliest cat I've every seen, no way am I adopting that one." 20 minutes later she was in my apartment chowing down on the Big Boy cat's kibble. I first saw Franklin-Christoph on Twitter (@PiperFC), when someone retweeted one of their posts. I went over to their website to take a look at their pens and added them to my follow list. And what great pens! One in particular caught my eye, Model 14 (M-14) which has an amazing capping and posting system using a rare earth magnet. 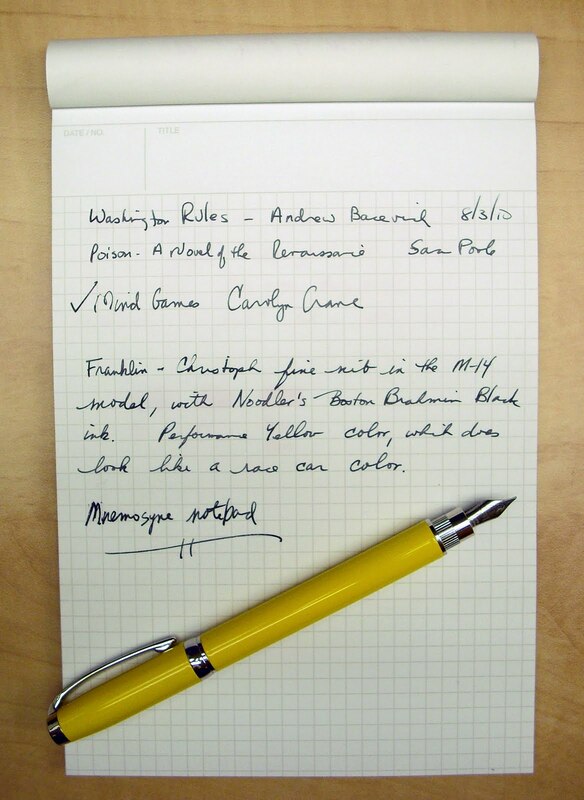 Well, it didn't seem amazing just reading about it, but now that I've got the special edition Performance Yellow Fountain Pen with a fine nib inked and in my hands it does definitely seem fantastic. First, this is one of the heaviest pens I've every used. But it's not the entire pen that's weighty, just the cap. 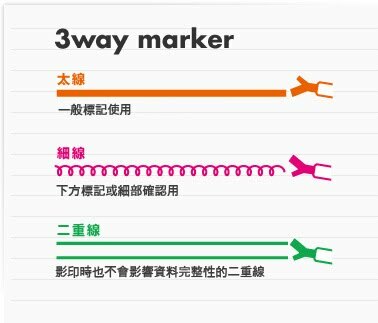 Because of the magnet, the cap weighs about 0.8 ounces, while the rest of the pen (barrel, nib, capillary, and a filled ink converter) weighs 0.9 ounces. And the reason for the heavy cap is simple: the magnet that holds the cap in place either over the nib or posted on the back. When closing the cap over either end there is a very loud, satisfying click and you can feel the magnet making contact with the steel section and nib/feed or with the identical steel post at the end. This is the first fountain pen that I can say I'm really not worried that I'll lose the cap when it is posted, as it actually takes some strength to break the magnetic lock and pull the sections apart. So how well does it write? Beautifully, which didn't surprise me. As I'm more inclined to Japanese fine points, which are much thinner in width than European or American fine nibs, I wasn't sure how I would like this fine line. 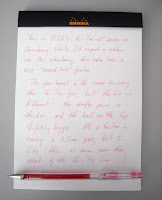 It's more along the lines of a Pelikan 205 fine, which is something of a fine-medium point and gives a very nice line. In other words, I like the M-14 fine nib quite a lot. Finally, I have to say I'm very impressed by the level of detail on this pen. The threading on the sections is perfect. The clip has a diamond pattern that's almost invisible until it surprises you when you start really looking at the pen. The Performance Yellow color looks like something you'd see on the race track (f it had a number inside a circle on the side I'd be asking for its pole position) And the magnet is very strong--very. I didn't realize how many paper clips I carried in my purse (handy for re-setting an iPod or PDA) until I took out my M-14 and found half a dozen stuck to the cap. Is this a pen I'd recommend? Absolutely! Take a look at their website and, if you Tweet, add them to your follow list. Lots of great pens to choose from, and the shipping is very fast so you'll have your new pen in a few days. In addition to the great pen, Franklin-Christoph offers a lifetime warranty for added peace of mind (and the faux alligator gift box is another thoughtful detail as well). If you've ever seen Top Gear on BBC America you basically know the theme: 3 middle-aged men talking and test-driving cars. On the Top Gear special where the three lads drive the length of Vietnam in 8 days, their transportation was motorbikes which left one of them in a week-long foul mood. So he played a number of pranks on his two companions, one involving crushing a camo-colored bike helmet and then offering a replacement-in shiny, sparkly pink--all the while explaining that color was purely a cultural phenomenon and in Vietnam pink was the color of a warrior. Snicker, wink, snicker..
No matter how m uch we may object, pink is for girls and always will be whether it's lipstick or gel ink pens. But if you want a pink that isn't your usual pale, frail, pink then what to do? 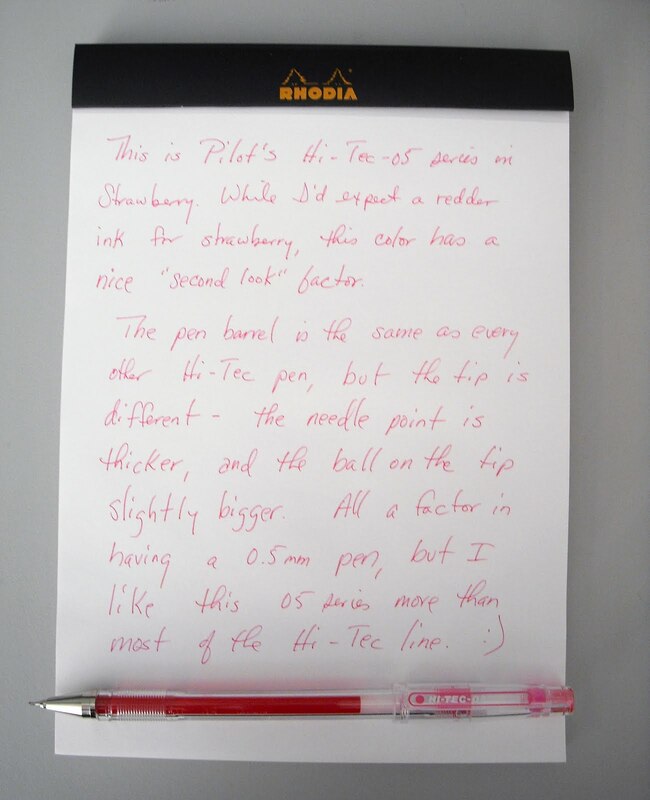 Well, check out Pilot Hi-Tec-C, where you'll find the 05 gel ink pen in Elegance Pink from the the Cosmetic Colors (!) line. It's a very dark pink, not necessarily hot pink but definitely a strong color that might have a touch of blue in it. Like all the Hi-Tec gel ink pens, this one writes smoothly, while the 05mm is my favorite line width. 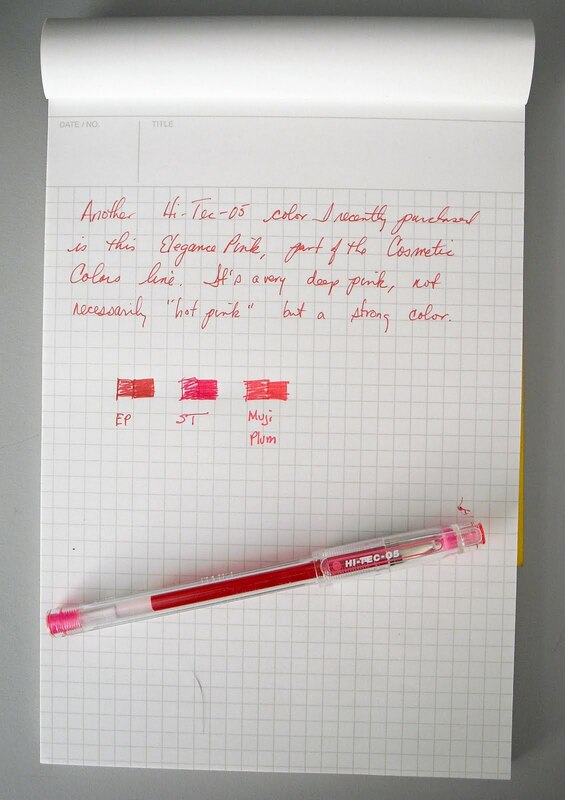 Looking at the color next to the Hi-Tec Strawberry, the Elegance Pink definitely looks dark with a blue tinge to it. The Muji Plum in the accompanying pic looks pale and a tad washed out next to these two strong colors. So Elegance Pink is a perfect dark pink that doesn't yell out to the world "I still dot my i's with tiny hearts." 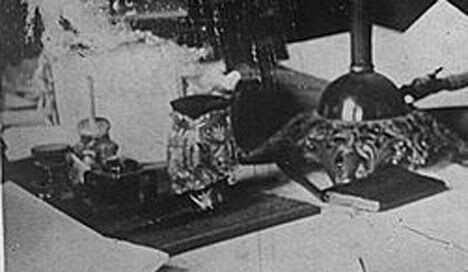 This essay began when N orman Haase of His Nibs invited me to contribute to the writers’ page on his Web site. I’m a “reviving penman”, and a semi-retired technical writer and advertising salesman. Recently I finished a book-length commentary in manuscript on health care, and I’ve written a whole lot of unpublished ephemera for my own amusement and uplift. The thoughts below are pretty much a sales pitch for fountain pens to myself and the readers. F irst off, the ballpoint pen knocked out the fountain pen for good reason. Take a look. Reliable and disposable stick pens can be had for as little as a dime each when bought in quantity. Inexpensive disposable fountain pens start out at about $3, or thirty times as much, if you can find them. I told Norman I’d suggest a fountain pen to any student or writer for the purpose of changing up, or breaking out of a bad groove. I’d been an amateur drummer, and sometimes you can climb out of a musical rut by changing your tools, such as working the toms, or laying on the wire brushes. 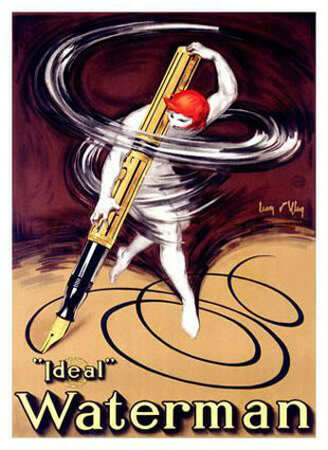 So how do fountain pens stimulate the writer’s and thinker’s instincts? Fountain pens offer an enormous variety of materials, such as lacquers, plastics, and common and precious metals. Embellishment and varied designs, many imitating architectural motifs and the natural world, are popular even among inexpensive fountain pens. Think of engraved handguns, highly polished watches of precious metals, and pocket knives sporting Damascene blades tucked between handles of rare wood, all small utilitarian objects where decoration adds to the experience of ownership and use. Among some folks, especially collectors and high rollers, the pricier fountain pens offer bragging rights and social prestige. Remember Simon and Garfunkel giving elephants and zebras characters and occupations in “At the Zoo”? Well, the pens in my modest desk rig have personalities, too. My Jinhao Evening Stripes is dignified and statesmanlike; my Duke #962 is the pen you’d see a harried Manhattan businessman using on a cross-country train trip in the 1920s; the Crocodile Silver Rain is a chromed-up new Cadillac from 1957, or part of an astronaut’s desk rig at his Cape Canaveral office. My disposable Pilot Varsitys and Sailor Ink Bars seem like something you’d see in a Vietnamese café or Lagos bar. Ergonomically designed and tipped by a wonderfully smooth, plain nib, my Lamy Safari is like a nicely worn sofa or comfort food, and it tickles me that Europe still manufactures pens that Americans can afford. My venerable Parker 75---well, I really can’t “place” it, I guess because its restrained appearance and use of gold and sterling silver seem universally “bourgeois”. Psychological gimmickry? Sure, but it adds interest to writing, and stirs up the gray matter. The nib-and-ink combination is where fountain pens arguably offer technical superiority over ballpoint pens. Try the Point Test. Take a fountain pen and gently press your writing paper with it to make a point. Do the same with a ballpoint pen. You can’t draw a point with a ballpoint, can you, not without twisting the pen? Try the Line Test. Draw a line with your fountain pen, then with a ballpoint pen. Note the difference in writing pressure. When you think of fountain pens, picture Teflon-coated ice skates on wet ice at 32° F. When you think of ballpoint pens, imagine mud-covered roller skates on hot asphalt at 115° F. The differences in ink viscosity and pen tip coefficient of friction can be striking. 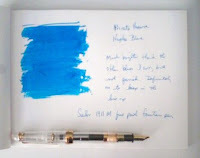 According to the pen community bloggers, some folks with arthritis prefer fountain pens for their ease of use, and those of us with weaker eyesight may find some highly saturated fountain pen inks better suited to them than ballpoint pen inks. Less hand- and finger-cramping are reported at least once. 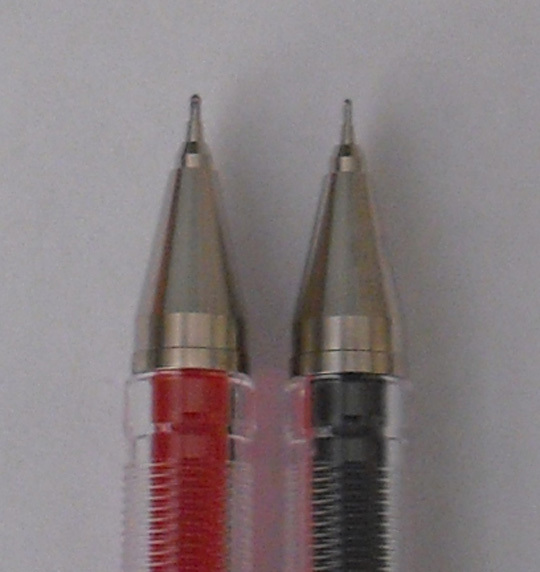 The fine and extra fine nibs (available on some pens) mounted on unposted fountain pens may be ideal for those with smaller hands or handwriting. Imagine if nibbed pens had disappeared for centuries, then only recently been rediscovered by an enterprising manufacturer. How would a pitchman hawk fountain pens today at your county fair, or big-city street corner? “Ladies and gentlemen, the wisdom of the Pharaohs and the words of the prophets were written with the technology that’s in these amazing, never-before-available pens! Just ask yourselves, folks---how can you do better!! ?” Tough sell to be sure, but I’d find some buyers, and I’m pretty confident they’d enjoy their pens. 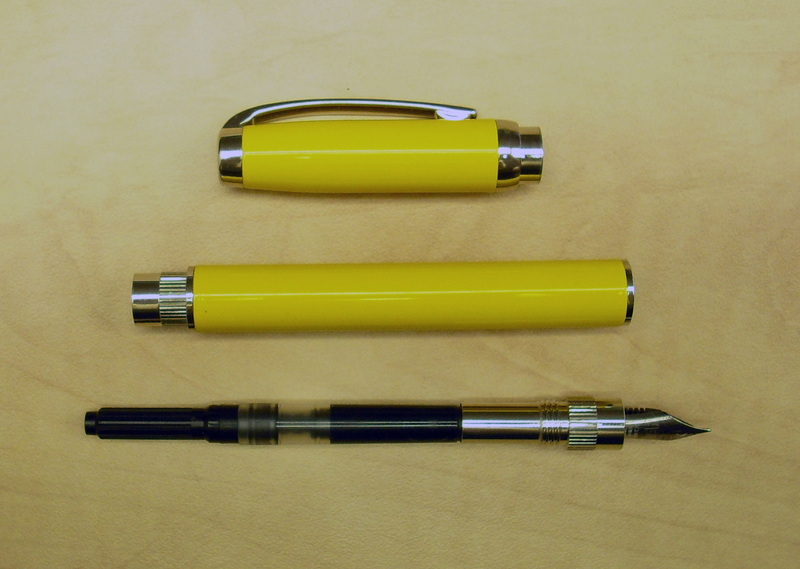 Today’s fountain pen retail deserves a fuller treatment in a separate article. Unless you live in our largest cities, or a handful of smaller towns with specialty retailers, you’ll be buying over the Internet. Complaints that I’ve read are few, and center almost exclusively on disagreements over the condition of used pens sold on eBay. Fountain pen prices have remained remarkably consistent over the last eighty years. A plain student’s pen cost maybe two or three hours of a low-wage American worker’s pay then; a high-end Parker or Waterman maybe 40 or 50 hours’ pay. That price spread roughly holds today. Yet, Monsieur Bich’s stick pen is available nowadays for as little as two or three minutes of a low-wage worker’s pay! So, you’re thinking about a fountain pen, but you have that lousy feeling you’re going to make a darned fool of yourself. Think about this. Many of the poorest American households the last twenty years have been persuaded to buy a “writing” instrument that costs as much as a high-end European or Japanese pen, and will barely last five years on average. Yep, it’s that picoliter-spritzing computer printer with the ink cartridges at $15 a pop, twice as much per milliliter as many generally available fountain pen inks. So, go ahead, you’ve spotted the fountain pen you want from an Internet retailer you’re willing to trust. Write that check, send the Paypal transfer, you’ll be okay. You all know the solitary pleasures of the study, which for me is often the kitchen table. There’s a special sanity---the word is not too strong---that takes over when you set pen to paper. Maybe you’re drafting a love letter, or composing that essay that finally speaks the truth to power, or working out how your protagonist will get himself out of a scrape, or compressing a blog post into 150 well-chosen words. Sure, I’m keeping my inexpensive ballpoints and disposable mechanical pencils. But, it’s my small clutch of fountain pens that lend a sense of occasion and gravity to my writing. Proof of the pudding is in the eating. This morning I sent a postcard to a woman I’ve know n for years who’s traveling in Washington State. I used my Jinhao Evening Stripes (right), described by Norman as having a Western-sized medium nib. What Linda will see is an ink (Private Reserve’s Velvet Black) that’s remarkably darker than what she’s used to, and something unexplainable about the handwriting---the nibbed pen’s variation in line width. She’ll guess I want to make an impression on her. That’s the whole point, isn’t it? 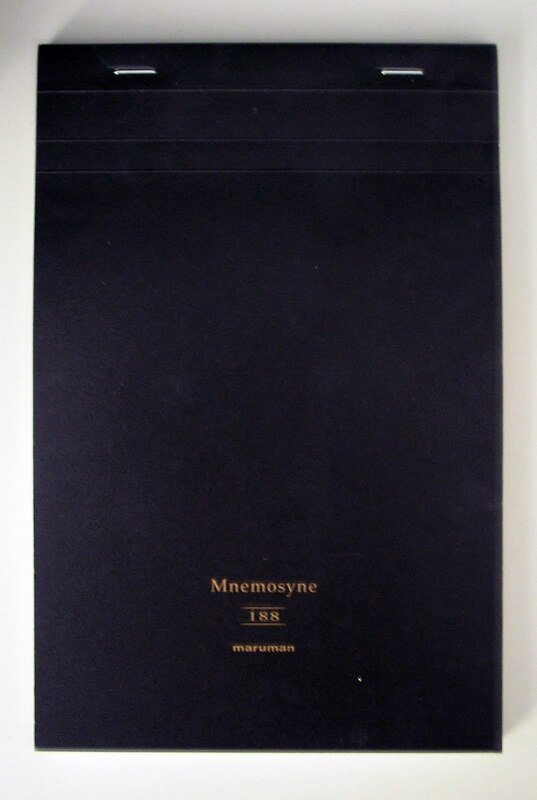 I love the Maruman Mnemosyne line, with the slick black cover and bright neon yellow sheet on the inside explaining who Mnemosyne was (the Goddess of Memory and the mother of the 9 Muses). The 188 in particular is a favorite, size A5 (almost the same as a Rhodia No. 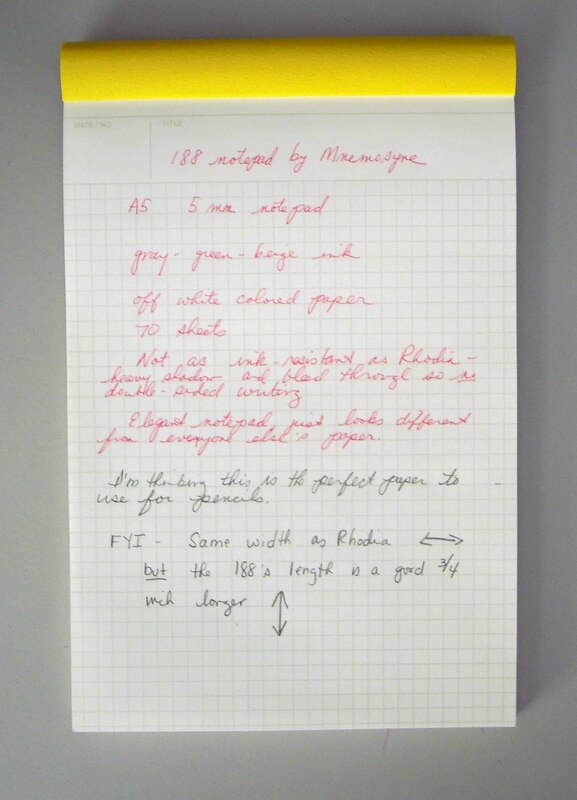 16, but the 188 is about 1/2 to 3/4 of an inch longer) with one-sided gridding of pale brown-gray-green ink that doesn't get in the way of writing or reading. The paper is nowhere near Rhodia quality of 80gsm, but it's fairly close (possibly 70gsm to 75gsm). I'd actually say this paper is more pencil friendly than ink-friendly, even gel ink will leave a heavy shadow that makes using both sides impossible. The cover and back material are actually a bit thicker than Rhodia and don't wear down as fast or as obviously. I like the way the pencil looked and felt gliding over the paper as I tested it out with my strawberry Hi-Tec-05 gel ink pen and a Koh-I-Noor pencil. I didn't notice any obvious smearing, either. So the 188 is a good work-day notepad, expensive as all get-out but worth the money if you want something that's sturdy and good-looking for projects of any and all sort. While wandering the National Stationery Show I noticed a lot of booths featuring pencils, and one booth in particular was showing off woodless pencils. I've been thinking of those for some time now, and so went looking on eBay. 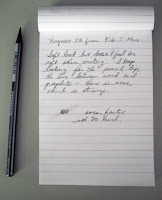 What I found was the Koh-I-Noor Progresso, a dark gray, lacquer-coated pencil made of Hardtmuth graphite. While I don't know much about pencils, I do know I like a softer pencil, such as HB, but then I hate the smearing. So I chose the standard 2B instead, and am definitely impressed by the laydown and staying power of the graphite. Smearing was minimal, and writing was soft and smooth and a bit strange. I kept looking for line between graphite and wood, but the pencil is one gray color, no lighter wood to mess with. The pencil is also quite weighty, solid grahite being heavier. Most of all, I love the idea of writing with a pure graphite pencil, and as a bonus there are no wood shavings to clean up. While I purchased mine from eBay, there are other places to buy so check them out if you can. Pilot never ceases to amaze with their many Hi-Tec variations: Hi-Tec, Hi-Tec-C, Hi-Tec-C-Cavalier, and this one that I've been doodling with: the Hi-Tec-05. It's a .05mm tip, which I like a lot (nice wide line) but the Strawberry ink is what makes it fun. Not as red as a real strawberry, more like cherry pink, but the ink in the barrel and the colored plastic ends means this pen will never get lost on my desk. And now that I think about it, the pen is much less likely to be "borrowed" and casually left on the colleague's desk. 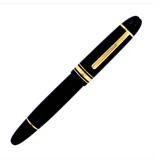 A conspicuous pen is hard to walk away with, much less use in front of a grieving, de-penned co-worker. There's one thing I did notice right away, large the needle point tip and ball are on this .05mm tip. The pic up top isn't very clear, but you can see the 05 compared to my Hi-Tec-C in Usuzumi (light grey ink), which is .04mm. The 05 is noticeably bigger, and there's a sturdiness to the point that I find lacking in the Usuzumi. But YMMV, and it's really the colors that make these fun. Over July 4th weekend I went out to Long Island to visit my friend Joe, and we went to see the finally-completed Buddhist Temple. 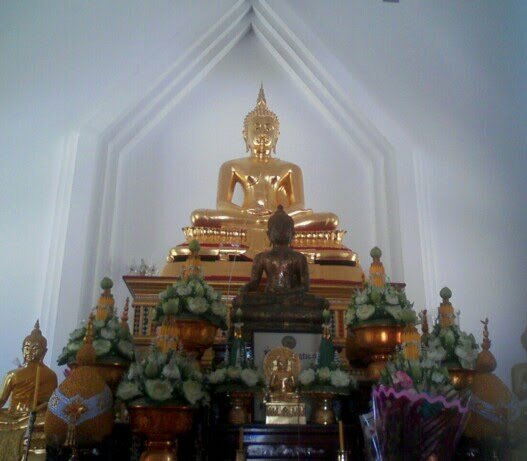 The Temple was started about 5 years ago, but the group ran out of money and so the outside was completed but the inside bare. 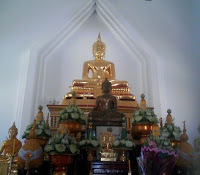 Now the Temple is finished, and a few weeks ago the group held an open house and consecration of the space and grounds. 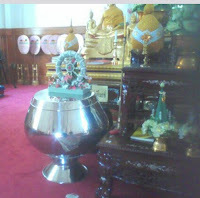 Besides the gold statues and flowers and candles was this interesting round wheel, a meditation or prayer wheel perhaps. In the pic above, with the wheel on top of the large steel stand, you can just make out that the paper wrapping around the wheel and base are dollar bills, something I often meditate on and enjoy thinking about.